The Arab Republic of Egypt, commonly known as Egypt, (in Arabic: مصر, romanized Miṣr or Maṣr, in Egyptian dialect) is a republic mostly located in North-Eastern Africa. 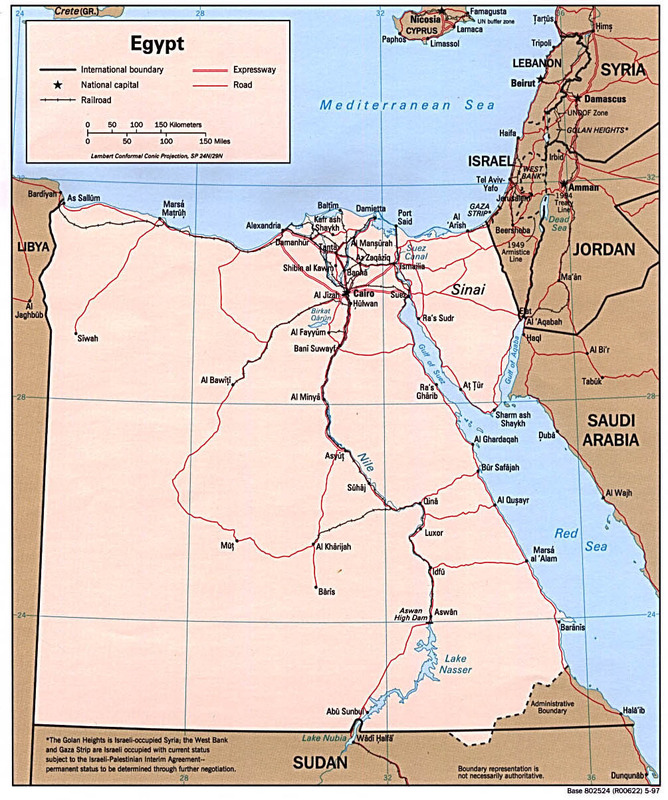 Covering an area of about 1,020,000 km² Egypt includes the Sinai Peninsula (considered part of Southwest Asia), while the majority of the country is located in North Africa. It shares land borders with Libya to the west, Sudan to the south, and Israel to the northeast. It is bordered to the north and east by the Mediterranean Sea and the Red Sea, respectively. The vast majority of Egypt's population inhabits the banks of the River Nile (about 40,000 km²). Large areas of land are part of the Sahara Desert and are sparsely inhabited. Egypt is famous for its ancient civilization and some of the world's most stunning ancient monuments, including the Giza Pyramids, the Karnak Temple and the Valley of the Kings; the southern city of Luxor contains a particularly large number of ancient artifacts. Today, Egypt is widely regarded as the main political and cultural centre of the Arab and Middle Eastern regions. Miṣr, the Arabic and official name for Egypt, is of Semitic origin, and possibly means 'a country' or 'a state'. The name Egypt came via the Latin word Aegyptus derived from the ancient Greek word Αίγυπτος "aiguptos", which in turn is derived from the ancient Egyptian phrase ḥwt-k3-ptḥ ("Hut ka Ptah"), the name of a temple of the god Ptah at Memphis. For details see the article Copt. The regularity and richness of the annual Nile River flood, coupled with semi-isolation provided by deserts to the east and west, allowed for the development of one of the world's great civilizations. A unified kingdom was founded circa 3200 BC by King Menes, and a series of dynasties ruled in Egypt for the next three millennia. The last native dynasty, known as the Thirtieth Dynasty, fell to the Persians in 341 BC who dug the predecessor of the Suez canal and connected the Red Sea to the Mediterranean. Later, Egypt fell to the Greeks, Romans, Byzantines and Persians again. It was the Muslim Arabs who introduced Islam and the Arabic language in the seventh century changing Egypt into a linguistically "Arab" nation once and for all. Muslim rulers nominated by the Islamic Caliphate remained in control of Egypt for the next six centuries. A local military caste, the Mamluks took control about 1250 and continued to govern even after the conquest of Egypt by the Ottoman Turks in 1517. Following the completion of the Suez Canal in 1869, Egypt became an important world transportation hub; however, the country also fell heavily into debt. Ostensibly to protect its investments, Britain seized control of Egypt's government in 1882, but nominal allegiance to the Ottoman Empire continued until 1914. Partially independent from the UK in 1922, Egypt acquired full sovereignty following World War II. Between 1924-1936 there existed a short-lived attempt to model Egypt's constitutional government after the European style of government; this was called Egypt's Liberal Experiment. In 1952 a popularly-supported military coup d'鴡t forced King Farouk I, a constitutional monarch, to abdicate in support of his son King Ahmed Fouad II. Finally the Egyptian Republic was declared on 18 June 1953 with Gen. Mohamed Naguib as the first President of the Republic. After Naguib resigned in 1954, Gamal Abdel Nasser, the real architect of the 1952 Revolution, assumed power as President and nationalized the Suez Canal leading to the 1956 Suez Crisis. Between 1958 and 1961 Egypt and Syria formed a union known as the United Arab Republic. The Pyramids of Giza are at the heart of Egypt's thriving tourism industry. Egypt has been a republic since 18 June 1953. President Mohamed Hosni Mubarak has been the President of the Republic since October 14 1981, following the assassination of former President Anwar Sadat on October 6 1981. President Mubarak is currently serving his fourth term in office. He is the leader of the ruling National Democratic Party. Prime Minister Ahmed Nazif was sworn in as Prime Minister on 9 July 2004, following the resignation of Dr. Atef Ebeid from his office. Egypt operates under a multi-party semi-presidential system where the executive power is divided between the President and the Prime Minister. Egypt holds regular single-candidate presidential and multi-party parliamentary elections. The last presidential election was held in 1999 and the next one is scheduled to be held in October 2005. However, there is expressed concern from international human rights observers concerning freedom of speech and government interference in local elections. In late February 2005, President Hosni Mubarak announced on a surprise television broadcast that he has ordered the reform of the country's presidential election law, paving the way for multi-candidate polls in the coming election. For the first time in Egypt's history, the people will have a chance to elect their leader in a closely watched election. The President said his initiative came "out of my full conviction of the need to consolidate efforts for more freedom and democracy." However, the new law places draconian restrictions on the filing of presidential candidacies designed to pave the road for Mubarak's easy re-election. As a result most Egyptians are sceptical about the process of democratisation and the role of elections. One of Mubarak's major opponents is constantly winding up in jail, often for obscure politics-related charges. The Egyptian government has reputedly been notorious for corruption and bribery on a very large scale ever since Nasser, Sadat, Mubarak, and other members of the Egyptian Revolutionary Command Council forced King Farouk I to abdicate during the Great Cairo Fire of 1952. Many Egyptians believe that the Revolutionary Command Council was responsible for the fire, used as part of their predetermined plot to overthrow Farouk. The permanent headquarters for the League of Arab States is located in Cairo. Egypt was the first Arab state to establish peace with the State of Israel after the signing of the Israel-Egypt Peace Treaty after the Camp David Accords). Alexandria is Egypt's second largest city and chief port. Here is that city's state-of-the-art library. Egypt has a burgeoning youth population. Egyptian countryside, south of Cairo. Every green plant is watered from the Nile. Geography, population, history, military strength, and diplomatic expertise give Egypt extensive political influence in the Middle East. Cairo has been a crossroads of Arab commerce and culture for millennia, and its intellectual and Islamic institutions are at the center of the region's social and cultural development. The League of Arab States headquarters is in Cairo. The Secretary General of the League has traditionally been an Egyptian. Former Egyptian Foreign Minister Amr Moussa is the present Secretary General of the Arab League. Egyptian Deputy Prime Minister Boutros Boutros-Ghali served as Secretary General of the United Nations from 1991 to 1996. Egypt is on good terms with all of its neighbours, and was the first Arab nation to make peace with Israel. It has a territorial dispute with Sudan over the Hala'ib Triangle. The completion of the Aswan High Dam in 1971 and the resultant Lake Nasser have altered the time-honored place of the Nile River in the agriculture and ecology of Egypt. A rapidly growing population (the largest in the Arab world), limited arable land, and dependence on the Nile all continue to overtax resources and stress society. The government has struggled to ready the economy for the new millennium through economic reform and massive investment in communications and physical infrastructure, much financed from U.S. aid. Egypt is the second largest recipient of such funds from the United States after Israel. Economic conditions are starting to improve considerably after a period of stagnation due to the adoption of more liberal economic policies by the government, as well as increased revenues from tourism and a booming stock market. Egypt is the most populous Arab country, at about 74,000,000 people. Nearly all the population is concentrated along the River Nile, notably Alexandria and Cairo, and along the Nile Delta and near the Suez Canal. Approximately 90% of the population adheres to Islam and the remainder to Christianity (primarily the Coptic denomination). A great part of Egypt's landmass is desert. Oases include: Bahariya Oasis, Dakhleh Oasis, Farafra Oasis, Kharga Oasis, Siwa Oasis. The capital city, Cairo, is Africa's largest city and has been renowned for centuries as a center of learning, culture and commerce of Egypt. Egypt also hosts two major religious institutions. Al-Azhar University, the oldest Islamic institution for higher studies (founded around 970 CE) with its corresponding mosque Al-Azhar. The head of Al-Azhar is traditionally regarded as the supreme leader of Sunni Muslims all over the world. Egypt also has a strong Christian heritage as evidenced by the existence of the Coptic Orthodox Church headed by the Patriarch of Alexandria, which has a following of approx. 50 million Christians worldwide (one of the famous Coptic Orthodox Churches is Saint Takla Haimanot Church in Alexandria http://www.St-Takla.org). Though considered a low-income country, Egypt has a thriving media and arts industry, with more than 30 satellite channels and more than 100 motion pictures produced a year. To bolster its media industry, especially with the keen competition from the Persian Gulf states and Lebanon, it has built a large media city that it has promoted as the "Hollywood of the East". Egypt has the only opera house amongst Arab countries. This page was last modified 22:31, 11 Aug 2007. This page has been accessed 66728 times.